"Will you kill someone you love because of love?" No: it’s more fun to torture them. When you have thirteen episodes to develop a show, good writers stick to one story. Great writers multi-task. With Ga-Rei -Zero-, Yomi and Kagura's friendly sisterly rivalry turns bittersweet upon the intervention of Oedipus' good buddy, Fate. The story's road takes a clever fork as one sister’s coming-of-age is achieved at the cost of the other's fall from grace. When the story begins in medias res, you feel like you've missed something big. Characters appear and emote without context, and I found myself re-watching episodes in chronological order to feel the full impact of each major battle. A clever bookend, though it leads you in the totally wrong direction, considering the entire cast of episode one is dead by episode two. What begins as Ghost in the Shell-esque dialogue with demons becomes schoolgirls with demons...without tentacles. Basic premise: our world today is being attacked by invisible spooks, monsters, the whole nine yards. Only a handful of families possess enough spiritual energy to see and slaughter said monsters. One such team is the covert Special Tactical Squad Section One. Their newest member will soon be Kagura Tsuchimiya, though there is little a traumatized ten-year-old can do for herself, let alone the world. It is up her to uncle and adoptive cousin, Yomi, to save her from despair. They both use swords to combat the undead (and dead-ish) as well as inherited beasts of their own. Yomi has Ranguen (manticore on steroids), while Kagura’s father bears the family legacy of burdening his soul with the white, fluffy chain dragon of unspeakable horror, Byakurei. The animation is magnificent, with smooth movement, flashy fights and great weather effects. Whether in a forest, underground sewer, or on the streets of Tokyo, I believe this world, which is why the 3-D graphics of some of the monsters are so disappointing. Many of the monsters are stock (or unionized, it's hard to tell with animated monsters) and the fights are disappointingly one-sided, although seeing Yomi fight with a holy water-spraying iron at one point was pretty grand. It is not all skirts and flirts, though. There are several comedic moments in the series (including a Comedy of Errors episode) that are uniquely humorous. Master Michael  I choose to say no more than "yes." The humor is very well-spaced and does well to soften the net emotional impact. As Yomi descends into darkness and eventually becomes an adversary, she becomes a walking massacre in a skirt that really ends up tugging your heart. Her fights with Kagura (especially episode eleven) redefine swordplay...and arm-drills. 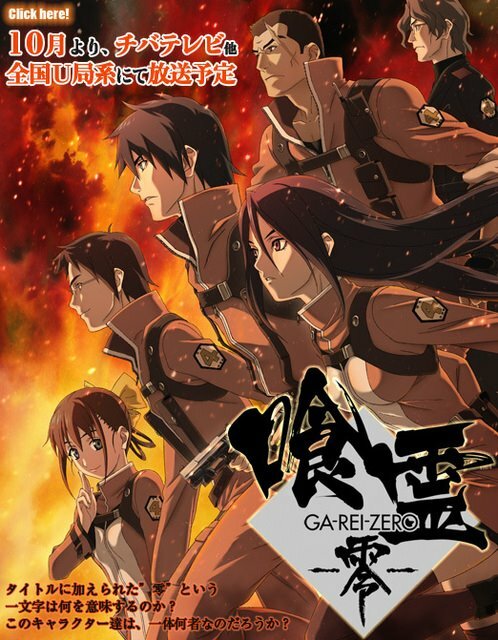 While Ga-Rei -Zero- has intriguing domestic insurrection, the majority of the series revolves around Kagura and Yomi's reactions to both of the series' major events, which if you know anything about anime, usually mean the passing of the torch, passing of legacy. The series is masculine in its gritty nature, but very feminine in its habit of focusing too long on Kagura crying, or lamenting, or grieving. If I had to give this anime a song, it would have to be "All The Things She Said." The main problem with this season is its waiting-for-a-sequel ending, which to me dismisses Yomi's purpose as a character beyond the threshold guardian for Kagura. Do I want more? Not without Yomi. As the first two episodes indicate, Yomi becomes the bad guy. Her descent is slightly more believable than Anakin Skywalker's, but far too easy. The nameless main villain corrupts her far too easily. Yomi was a great ally and a supportive, loving sister, which made her such a sinister villain, but to have her switch gears so easily feels like a quicker 180 than Will Smith in I Am Legend. Go ahead and watch, but tell me if you disagree with the "puppet-master" treatment of Yomi. A cool story of sisterly love and the hardship of legacy. 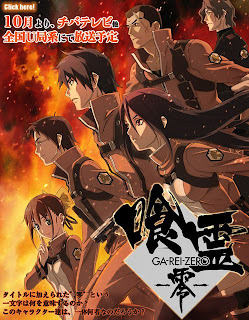 It is hinted with political manipulation and topped with fun monster-slaying; Ga-Rei -Zero- was a nice surprise, though I can’t imagine it generating a large following.